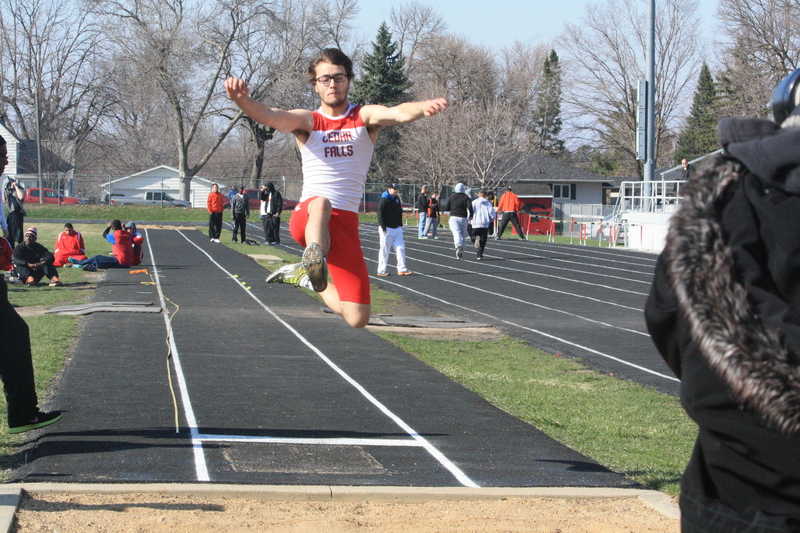 Senior Trevor Balm long jumps at the Cedar Falls Invitational on April 5 at the Cedar Falls High School track. After a terrific indoor season, the mens’ track team is looking to replicate the same success outdoors. The Tigers won their first outdoor meet at the Waterloo Triangular at Waterloo West. The Tigers’ next contest was Saturday, April 5, which was rescheduled to be at the UNI Dome after the originally scheduled meet at Marshalltown was cancelled due to rain. The Tigers shone during that meet as well, picking up some respectable times in all of their events. On April 8 at Marshalltown, the Tigers notched up seven first place events, including the likes of 100 meter dash, the 400 meter dash and the 1600 meters. After the Marshalltown meet, the Tigers travelled to Loras College in Dubuque for the Bob Varley Invite. There, the Tigers picked up two first place prizes, one in the 3200 meter run by senior Jonathon Smith and one in the 4×800 relay with senior Sam Ahrenholz, sophomore Hunter Lavallee, junior Dylan Southall and senior Jared Failor. In doing so, the Tigers won the meet, two points ahead of Dubuque Hempstead. Three days later at Waterloo West, in the 3200 meter run, senior Timothy Sevcik got first place, beating out teammate Smith by less than two tenths of a second. In the 400 meter dash, Ahrenholz picked up first place with a time of 51.60 seconds. Failor picked up another first place time in the 800 meter dash with a time of just under two minutes and in the 4×400 relay, the Tigers picked up a time 3:26.53. In the meet this past Monday at Oelwein, the Tigers continued their winning tradition, picking up five first place times, with sophomore Ethan Smith picking up two of them. Senior Conner Riehm had one in the 110 meter hurdles, 4×100 meters and the shuttle hurdle relay. All of these meets and times have been in preparation for the Drake Relays. The relays began yesterday and will run until Saturday. The Drake Relays are one of the biggest track and field events in the country, and in the past it has attracted the likes of Lolo Jones and Olympic gold medalist Harvey Glance. Junior Hiram Marquez said he thinks that the team has gelled quite well so far. CFHS men’s head track coach Dirk Homewood also said he is happy with the way that the team has performed. “We have had a fantastic season thus far. Our guys have been running hard and giving it their all in every meet throughout the whole season,” Homewood said. “I know that we will carry our current form into Drake.